Following the announcement last week that Russian soprano Anna Netrebko has withdrawn from Norma, the role will now be sung by Bulgarian soprano Sonya Yoncheva. Sonya Yoncheva made her Royal Opera debut in Plácido Domingo’s Operalia Winners’ concert in July 2012. She has subsequently sung Musetta in La bohème, Marguerite in Faust, Violetta Valéry in La traviata and Micaëla in Carmen for the Company. Her other recent engagements include Desdemona in Otello for the Metropolitan Opera, New York; the title role in Iolanta for Opéra National de Paris, and Mimì in La bohème and Violetta Valéry in La traviata for Berlin State Opera. Many congratulations to the Royal Opera for this fantastic replacement! Congratulations to the ROH. It is a very good choice and it maintains all the excitement around this new production!! Bravo to the whole team who managed to find such a high-level replacement in such a short time. Good choice. I greatly admired her truly excellent Desdemona to Antonenko's Otello recently at the MET. Not sure she's exactly Norma material, but it will be fascinating to find out! Exactly, not sure either about it but her Desdemona at the Met last Autumn was outstanding. Would be interesting to hear her in Norma. Made me think of Scotto who was a superb Mimi, a remarkable Desdemona and a great Norma. Pleased to see you have already reduced the ticket prices for Norma, good to see the ROH having been so proactive over this whole issue of the cast change forced upon them. One of those occasions where the replacement is preferable to the original. Now, if ROH want to make good the ticket sales of those who would have come just for Netrebko, you could bring in the Wagnerites by including Wagner's extra aria for Oroveso. An excellent choice. Well done ROH! Loved Sonya Yoncheva's Violetta last summer, hugely looking forward to seeing her in Norma. Thank you for such a speedy and wonderful casting change. And thanks also to the Met! Great replacement, hopefully the production will match the cast and not be like the recent Lucia fiasco. This is a big surprise. I don't think anybody was expecting Sonya Yoncheva. She was a wonderful Marguerite a few years back and was absolutely amazing as Desdemona last fall at the MET. You are a gutsy soprano Sonya Yoncheva. I totally agree with you, Michael. And I would like to add that I was really impressed and moved by your comment regarding Anna Netrebko's withdrawal. You wrote exactly the things I think and feel. Well done! Too excited about the replacement now and Norma looks even more appealing now than ever! Sonya Yoncheva did it again and stepped in for Netrebko on a short notice! Happy with the singer, but have you seen the pricing - up to £225 ! Seriously ? No way that would have been the pricing if this was the casting from the outset. Clearly there is a desire to make out the Anna premium wasn't too great - £170 to £190 would surely have been the realistic top price for a new production without one of the really really top drawing names ? Surely this is a mistake? Not confusing with Sondra Radvanovsky?! 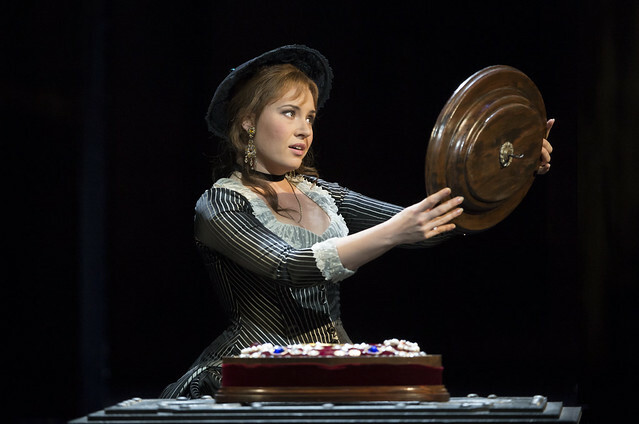 Kudos to the Metropolitan Opera for graciously releasing Sonya Yoncheva to the royal Opera. Very pleased at the quality of the replacement. Congratulations ROH. Second time Netrebko has disappointed us. Does ROH go on asking her? Sorry - 'Royal' with the capital R. Oops. Congratulations to the ROH Mr Holten and Mtro Pappano, Ms Yoncheva is definitely a great choice and tells a lot about Mr Pappano's idea of the work, a beautiful rich voice but not heavy, with dark colors, coloratura, legato presence and the biggest charisma in the opera world at the moment. Well done ROH. Sonya is an excellent catch and thankyou Met. I am once again excited and very much look forward to Norma. There must be egg on faces at Opera magazine. Their June issue has just popped up on my iPad telling me Tamara Wilson is the replacement. So what's the story there? Is she the backstop? Sonya Yoncheva was excellent when she substituted for Anna Netrebko in Faust and continues to improve. I'm sure she will do well, and thanks to the Met! Now that the Royal Opera has found a replacement for Norma, could they please offer us a little information about their further plans with Netrebko? Last time she cancelled the opera house at least told us that she would be returning in 2015. When is Netrebko now expected to return, and what will she be singing? In the writen statement sent by Mr.Holten in wich he was advising us there were already plans to bring Mrs.Netrebko back in one of the major role she had just tryumphed recently . I think it could be "Giovanna d'Arco" . I miss her and I am looking forward to hearing soon again at the ROH. We are missing the Best years of her career. Just incredible that we are getting a New Trovatore and à revival in 8 months none of them with the"Leonora" of the moment. Thanks for your comment, Michael. Yes I absolutely agree that we are missing Netrebko in her prime. The most important soprano in the world at the moment but she does not really sing in London. And I completely agree about Trovatore! Amazing that we get three different Leonora's over 12 months but not the one that everyone wants to hear! Congratulations to the Royal Opera for securing Sonya Yoncheva I've seen her in La Traviata and Faust and really excited about her singing Norma. My only concern, and we must all have them, is that as a young soprano is not the role a bit taxing for her, I think someone said that it was easier to sing Brunhilde than Norma. Otherwise will definitely booking to see it this autumn. Maria Agresta would have been a better choice for NORMA. She recently sang the role in Paris to great acclaim. Thanks for posting that nice comment. Too bad the ROH could not get Netrebko for a few Trovatore. Saw her in Paris in february and she was absolutely stunning. Many people are excited about Yoncheva doing Norma. But I disagree....Norma is not a lyrical part like Mimi or Violetta etc.! It is a dramatic coloratura role. Famous singers such as Radvanovsky or Devia spent many years of hard work doing similar bel canto roles before even considering singing Norma ! So it is in my opinion even a little bit disrespectful to the opera "Norma" itself to cast this young adventurous singer. Yoncheva may have all the notes, but, would she have the voice to sing Turandot or the Donizetti-Tudor-Queens?! Sondra Radvanovsky, Mariella Devia, or Angela Meade.would have been more appropriate choices.....they are all available this fall and ROH could have done multiple casting among them as Madrid Opera does in its fall season! why Netrebko was responsible enough to withdraw ! I agree that Mrs Yoncheva is more lyric soprano, not for Norma dramatic dark soprano !! there are people outside studying opera having beautiful voices and they can sing in big opera houses. We need to give chances for new singers, new voices not just sticking to some singers like Netrebko and Yoncheva and others... because I see singers cannot be famous without paying money or having connections in the world of the opera. Sorry about the this but it is the truth. Funny how people say Norma is a dramatic role and then immediately after mention Devia who has a very small voice. Would she even be heard over the orchestra if she sang Mimi? Norma is a bel canto role with not a particularly thick orchestration. There are some dramatic ensembles but it's not a Turandot. The difficult parts are the poignant lyrical moments and also controlling oneself emotionally. A smart singer should be able to negotiate it well enough. I'm sure Yoncheva will be coached by Pappano and the result will be great. I wonder whether this great woman must have experienced too much stress in her life. She looks likes 47 rather than in her 30s. I saw the dress rehearsal and all those that have worried (mainly for good reasons) will eat their words - as did I! This will be a historic event! Firstly the production is a breathtaking, heartbreaking and appalling reminder of the world we are living in - so potent with its images of religious hypocrisy. Secondly - she is absolutely stunning. Not the biggest voiced Norma, but every single sound she makes is completely appropriate, never over-parted, and unlike many Norma attempts, you hear every single note written! She has such an incredible presence and dignity and somehow makes every element of the plot speak to you in the most relevant way. Leave your preconceptions at the door - I've not seen anything like this for years!! If you can't see book for the cinema - and no, I don't work for the ROH! Paolo is totally right - surely everyone should trust Pappano's judgement! Her baroque experience hugely benefits her performance in this role and I'm a big sucker for a big voice! And Rita Snivel - who are you looking at? She is stunning and looks like a model in what she wears in Act Two, which I won't reveal because I don't want to spoil it for anyone! A superb performance last night, Sonya Yoncheva was spelling binding despite being dressed as a Catholic priest! Sadly let down by the costume designer, the production exposed the hyprocracy of the Catholic Church, was this what the composer intended?